Saqqara (Arabic: سقارة‎), or Sakkara, is a vast, ancient burial ground in Egypt, an area of 7 by 1.5 km (4.35 by 0.93 mi). It was the necropolis for the Ancient Egyptian capital, Memphis. 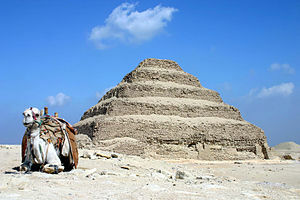 Saqqara has numerous pyramids, including the world famous Pyramid of Djoser. This is sometimes referred to as the Step Tomb due to its rectangular base, and its 'steps' (mastabas: the Arabic word for 'bench'). It is some 30 km (19 mi) south of modern-day Cairo. Djoser's pyramid is the oldest complete stone building complex known in history, built in the Third Dynasty. Another 16 Egyptian kings built pyramids at Saqqara, now in various states of preservation or dilapidation. High officials added private funeral monuments to this necropolis during the whole pharaonic period. It was an important complex for non-royal burials and cult ceremonies for more than 3,000 years, well into Ptolemaic and Roman times. The area from Giza to Dahshur was designated as a World Heritage Site by UNESCO in 1979. The official name is Memphis and its Necropolis – the Pyramid Fields from Giza to Dahshur. Some scholars think the name 'Saqqara' is not derived from the ancient Egyptian funerary god Sokar, but from a supposed local Berber Tribe called Beni Saqqar. ↑ Fernandez I; Becker J. & Gillies S. "Places: 796289136 (Saqqarah)". Pleiades. Retrieved March 22, 2013. ↑ "Memphis and its Necropolis – the Pyramid fields from Giza to Dahshur — UNESCO World Heritage Centre". Whc.unesco.org. Retrieved 2009-10-18. This page was last changed on 16 December 2018, at 05:57.